After design and manufacturing, virtually all products need packaging before they can be shipped and sold. Packaging can be essential to protect and preserve goods until they reach the end consumer, irrespective of the method of transport used. Packaging can be made from cardboard, wood, polythene or other resistant materials, and is often custom made to suit the dimensions of the product concerned. Finished products are packaged either by hand or by machines, depending on whether the production process is small scale or industrial. All large scale production lines, however, end with one or more packaging machines. Packaging machines, whether fully automatic or semi-automatic, perform a number of steps. Wrapping machines, for example, stabilise loads on pallets by wrapping them in foil or netting; taping machines seal cardboard boxes with adhesive tape; strapping machines hold packs together with plastic straps; boxing machines, as their name implies, place products in individual boxes. The specialist technicians employed to construct, customise and service packaging machines are always on the move as they have to visit customers’ factories to install their machines, train personnel and provide servicing and repair as needed. The photos on this page show an Opel Vivaro L1H1 fitted out for a company specialising in the maintenance of packaging machines. Let’s have a closer look at how Syncro System went about this particular upfit. a small “workshop area” with closable compartments for carrying all the tools needed to work on site, plus a vice and a workbench. 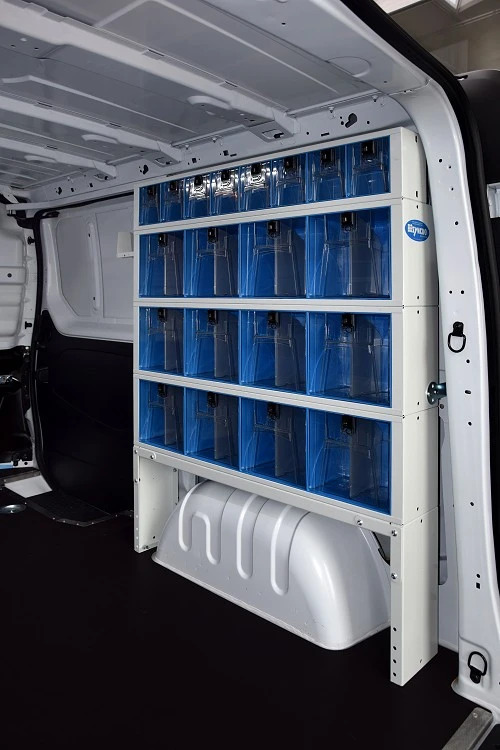 As already stated, one of the requirements was to protect the floor of the packaging technicians’ van with a robust, impact-resistant panel. Syncro System’s answer to this requirement came in the form of a resinated plywood floor panel, installed before the racking as such. Resinated plywood is tough and attractive at the same time. The panels made from it are cut to size and drilled to suit the model of van concerned prior to installation. Once laid over the vehicle’s floor they eliminate ridges and troughs and create a uniform, water resistant, non-slip and perfectly flat surface. 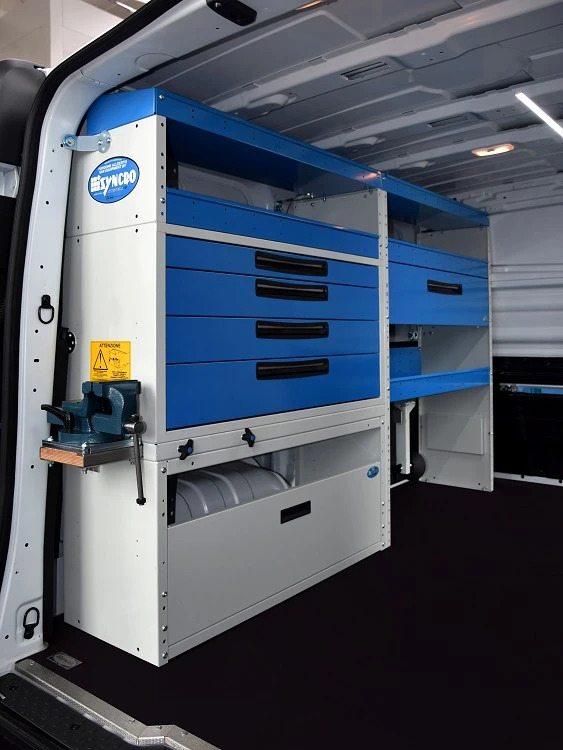 Syncro also customises its protective floor panel to leave easy access to all the vehicle’s standard cargo retaining points. The left side wall was fitted with two cabinet sections. 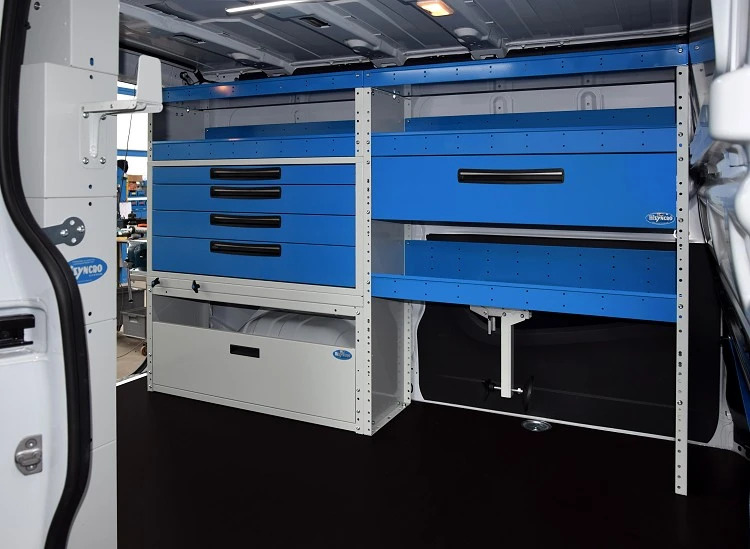 The first, nearest the rear door, consists of a wheel arch cabinet with a door, four long metal drawers and a section of open shelving with dividers and non-slip mats. Between the wheel arch unit and the first drawer we can see a vice on a pull-out support: once opened, this useful accessory also acts as a practical bench for small jobs. The next set of cabinets consists of a universal tool-case cabinet at floor level, and three levels of shelving with and without front doors. Both cabinet sections are topped by a full length tray. The right side wall has been fitted with a unit of transparent plastic drawers in different sizes. The drawers themselves can tilt forward and even be completely removed. The storage on this side of the van is of reduced depth to leave maximum available floor space at the centre of the load compartment. The bulkhead is equipped with a lashing system for normal and large items, formed by a cargo rail and straps.